The collision "could knock us out of the Milky Way." An upcoming galactic collision is likely to wake the black hole at the center of the Milky Way and turn our home galaxy into a quasar — it could even fling our solar system into intergalactic space, according to new research. Astronomers long thought that the Large Magellanic Cloud, a nearby galaxy that slid into the Milky Way’s vicinity about 1.5 billion years ago, would settle into an orbit around our galaxy. 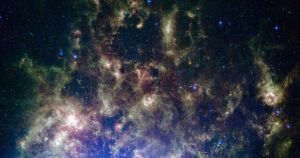 But according to the new paper, which was published in the journal Monthly Notices of the Royal Astronomical Society, the Large Magellanic Cloud has far more dark matter than previously believed. That means it has much greater mass and is more likely to slam into our galaxy than orbit it. The epic collision will likely awaken the dormant black hole at the center of the Milky Way, causing it to gobble nearby matter and swell as much as 10 times in size. The good news is that the galactic collision won’t take place for two billion years — long after anyone currently living on Earth is gone. But while we’ll escape unscathed, the same can’t be said about our galaxy.